After a recent trip to the farmers market for a basket of peaches to make jam, I saw they also had local blackberries in. Oh, I love summer! And while cutting the peaches for the jam, I just knew I was going to have to make a dessert too - and I was feeling like a pie. But it was going to have to be quick, because I also had dinner to cook! When my grandparents visited last year, my grandma asked if I enjoyed making pies. Yes, but I could not find the perfect butter pie crust and ended up with too many flops too frequently. Well, my grandma told me she would come up with something and a week later I had a recipe in the mail. Since then I've used this all butter pie crust recipe numerous times, and it's delicious and perfect. And special too since every time I pull it out it makes me think of her. I love baking pies, but when I'm in a hurry, I'll make a rustic pie which uses only one crust, instead of two. Once rolled out, you plop your fruit in the middle and simply fold up the sides. Don't worry about perfect edges! In this case, I make the pie crust first before combining the fruit mixture so that it doesn't allow time for the peaches and blackberries to get juicy before it heads into the oven. It may not be as pretty (hence the word rustic), but it's definitely just as delicious! As a final note, I try to cut our sugar down whenever possible, so my pie had minimal sugar. If you're feeling like you need it a little sweeter, you may want to add more sugar. I find that using less sugar allows the natural sweetness and flavor of fresh fruit to shine through and with homemade whipped cream on top, it's a perfect quick summer dessert. Hope you enjoy! Preheat oven to 425 degrees. Combine flour and salt in a bowl. Using a pastry cutter or your fingers, add butter to flour until blended and fine textured. Add 1/4 (less if it is enough) cup cold water, one Tbsp at a time while mixing with a fork until it can be gathered into a ball. Roll out the dough with a rolling pin on a lightly floured surface. Place a piece of parchment paper on a cookie sheet and gently lift the dough and lay it flat on the paper. Mix together peaches, blackberries, flour, lemon juice and sugar. Place fruit mixture in the middle of the pie dough. Fold the edges of the pie dough over the fruit. Sprinkle course sugar over the top if desired. Bake for 30-35 minutes until crust is lightly golden brown and fruit mixture is bubbling. Hot days, sunshine, blooming hydrangeas... it felt like it was time to bring some summer inside. I remember when I was newly married and we were living in our first home, I couldn't wait to start decorating and changing things around seasonally. I don't make as many changes now, but I still feel the same way. There's nothing like making a few little changes each season to make everything feel fresh, clean and homey again. Fortuitously for me my husband needed to get his hair cut one morning we were out running errands, which gave me the perfect excuse to quickly walk through a couple of my favorite antique stores which are practically next door. ;-) I found three perfect blue transferware saucers to swap with the brown for summer. It's funny how making one small change can bring out similar colors that are already there, like the blue gray painted wood and blue dishes in the cabinet. I love that the hydrangeas are just starting to bloom. Every spring I look forward to these blue and purple blossoms! Happy (almost) Summer to you! I love this stage in the garden... checking each day to see new blooms and fruits and vegetables growing and ripening. Anticipating all of summer's bounty. Naturally, along with that came a lot of weeds and grass, and I've very slowly been trying to get the garden in a more manageable state. I think we may have squash by next week! Three years ago we planted two grape vines at the back of our property and we can hardly believe how well they are doing this year! I didn't get a picture, but this afternoon the girls were actually laying underneath the arbor with a blanket, playing and giggling in the shade it provided. I think I may be making grape jelly this summer! There must be a hundred clusters. And while I was taking these photos, I actually noticed a sweet little nest tucked into the vines, complete with four beautiful eggs. This year I have really had a helper in the garden and I just love it. Jillian has been helping me pull weeds and pick lettuce (voluntarily even), while Rosetta makes endless amounts of mud cookies and cakes. Lastly, I'm sorry for the delay, but after a busy week I finally got around to randomly drawing two winners for a copy each of the New American Homesteader magazine. They are NanaDiana and Farrah. I've notified both via email. I wanted to mention also that I was so incredibly touched by all the kind comments left on that post. I wish so badly I had enough copies to give to everyone! Thank you again for reading and for your encouragement. I hope you all are having a wonderful Father's Day weekend! The summer issue of New American Homesteader is out (giveaway below)! This was such a fun issue to contribute to - for one thing I was writing and taking photos of something I love to do (preserving), but I also got to do a lot of it with my mom, and we had such a great time working together. My grandma, and then my mom, have always preserved homegrown foods and they are such an inspiration to me. This issue, like the first, is packed from cover to cover with lovely photos, inspiring stories and guides to all things summer, like gardening, canning & preserving, and much more. While preparing for this issue, we took a lot of photos and edited a lot of photos! Not all made it into the magazine, but the above photo (one of my favorites) did. I took this photo at my mom's house... I was there to help take photos of her preserving corn, but ended up emptying her entire pantry cupboard and filling it with her preserved goods. I'm not sure there is anything more appealing to me than rows of canned goods in a kitchen... my grandma's kitchen is like this and it brings back so many wonderful memories. 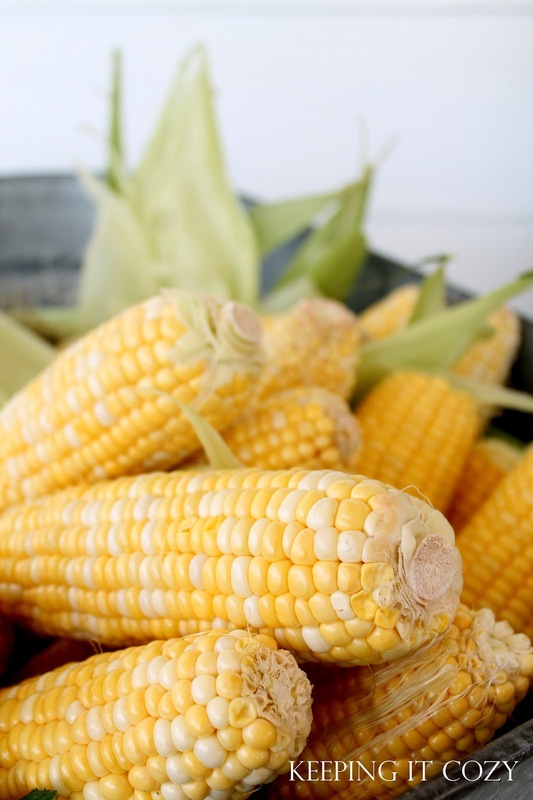 There are easy instructions on how to can goods like green beans, tomatoes and pickles and, even easier, freezing corn and berries. With summer's bounty approaching, I'm looking so forward to doing some preserving! I feel hesitant to mention this (it not being easy to talk about myself), but it was such an honor to have one of my photos selected for the cover. I snapped this photo last summer of local strawberries, never dreaming it would be on the cover of a magazine. I think I like that best of all though - it wasn't snapped with any other intention than enjoying the beauty of the season's first fruit. 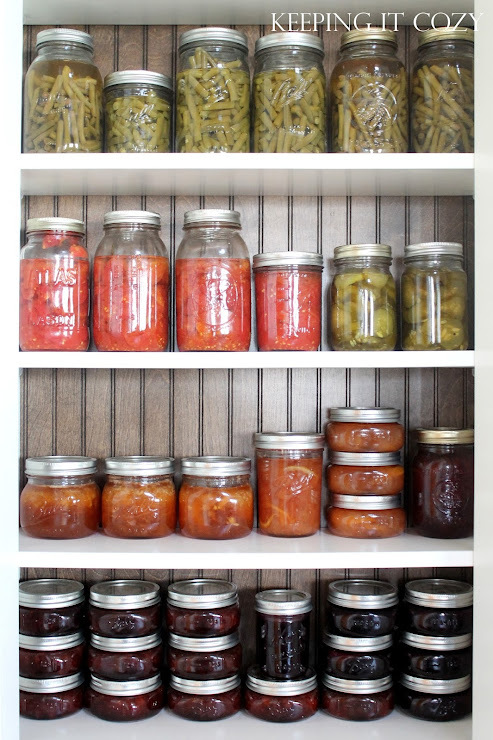 There's so much joy in canning and preserving and I hope you get a chance to pick up the issue! I also have a couple extra issue that I requested just so I could give them away here - I am so thankful for each of you taking the time to read. You encourage me and make me smile and I'm so grateful for that. 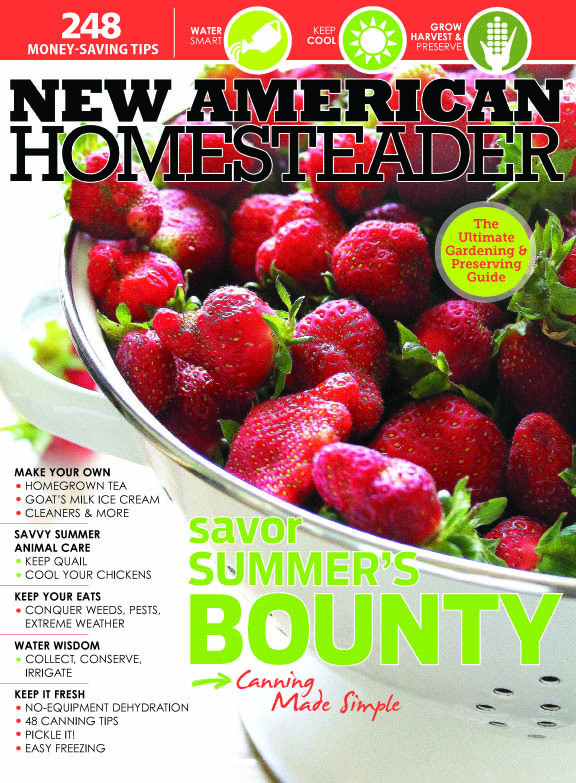 I will select two winners to receive one copy each of the summer issue of New American Homesteader. To enter, all you need to do is leave a comment. And just a reminder, you don't have to have a blog to enter! Just be sure to leave your email address so I have a way of contacting you should you win. After anticipating this week for months now, we took some time to get away and vacation just the four of us. We were away for eight days - a couple days with good friends and then the rest of the time spent at the beach, where we rented a cabin. We stayed at a state park in Florida, and the natural landscape was so beautiful. That's the ocean in the background, with wild magnolias and other greenery growing on the other side of tall sand dunes. One of our favorite things about this beach area was that it was so bike friendly with bike paths everywhere, even alongside roads. I don't think there was one place you couldn't bike to, and while we enjoyed biking around the park, there was nothing better than our ride to the ice cream shop down the road (smile). But as nice as our vacation was, there really is no place like home and we were so happy to be back! I hope you had a nice week too!